I keep my finger on the pulse of military transition and veterans affairs, and in my daily search for news and insight into transition I ran across this article a few days ago. I read it once and then re-read it several more times. It was included in an Orders to Nowhere Transitionnews post, but it is well worth reposting for those who may have missed it the first time. 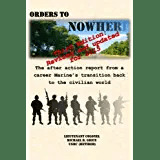 The author, Sultan Camp, is both a veteran and a recruitment expert at Orion International. He squarely pounds the nail through the board with his nine points, all of which I agree with. If you are transitioning now, will be in the future, or already have, read this and pay attention to what the author is saying. You can read the original article here. And here. The 10th item on the list, should I be so bold as to add to it, would be for military folks and veterans to stop drinking their own bathwater in terms of what they offer employers. Sure, you have mad leadership skills. Sure, you have used those skills in the most dire of situations. Sure, you know how to get people to do things that they don’t want to do. That said, the military does not have a patent on leadership; the corporate world has been getting along just fine without you by employing the leadership and management skills that resonate in the business environment. In addition, leadership is a bit different when you can send those who disobey you to the brig. In the corporate world leadership is not the same as the military, and the differences are such that if you don’t adapt to the outside world then the outside world will ignore you. Recognize that you have tremendous leadership skills (great! ), and that those skills need to be paired with another set of skills that an employer actually needs. They already have leaders, managers, and employees. To become one of them, you must show that you can do more than stand around with your chest puffed out and barking out orders. You need to be a contributor to what the company sells, makes, or otherwise provides to customers. Wrong approach. I’ve seen instances where the most junior servicemember outperformed a much more seasoned military leader because of one simple strategy: practice, practice, practice. Practice with someone who regularly hires or who has hired people at your level recently.